This past weekend, LEGO officially launched the 21316 The Flintstones set, which is the latest fan-submitted project to graduate from their LEGO Ideas program. It clocks in at 748 pieces, and features The Flintstones' iconic car, house, and minifigures of Fred Flintstone, Wilma Flintstone, Barney Rubble, and Betty Rubble. If you want to bring The Flintstones set home, today, February 20th, is your first opportunity. The set is available to order now for LEGO VIPs with a price tag of $59.99. If you aren't a VIP, becoming one is easy - and free. Otherwise, you'll have to wait until March 1st and hope that this set doesn't sell out before you get a chance to grab one. 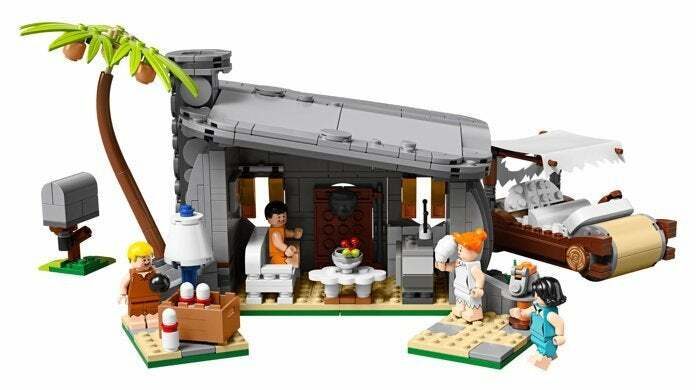 "Modern Stone Age suburban life in Bedrock comes to life in LEGO form with this LEGO Ideas 21316 The Flintstones collectible building set, the latest model designed by a LEGO fan, submitted to the LEGO Ideas community, and selected to become an official LEGO set! A wonderfully nostalgic building toy, it features The Flintstones house and iconic family car. The detailed house has a removable roof for easy play, an opening front door, sofa, TV, coffee table, bowling ball and bowling pin elements, plus a green garden baseplate with a buildable palm tree. Build your own Flintstones vehicle that seats 4 minifigures and features a new-for-March-2019 fabric car roof element and an attachable dinosaur rib for creative play. The first animated TV series ever to be aired in a prime-time slot, The Flintstones cartoon was first broadcast in America in 1960 and has become an enduring family favorite around the world. Recreate hilarious scenes with minifigure versions of Fred and Wilma Flintstone and their friends Barney and Betty Rubble."